What is a slow boat? A slow boat is a boat that is slow. Or it’s not actually super slow, but it’s slower than a speed boat, hence the name. That didn’t tell me much. Okay, imagine a comfortable bus or a train carriage that moves on water. The seats are very similar, although they are not bolted on the floor, so you might accidentally knock one over when you try to lean on it. Is there a toilet in the slow boat? Yes, there are one or two toilets at the back of the boat, just behind the bar. They are squat toilets, aren’t they? No, they’re not! Most of the Mekong river slow boats have new toilet seats. There might even be toilet paper! Slow boats waiting at the harbour of Huay Xai. Okay. And what’s this bar that you mentioned? Most of the slow boats have a small counter on the back, where you can buy beer, water and other drinks. What about food on the Mekong river cruise? The boats I rode didn’t offer proper meals, but you could buy potato chips and noodles if you wanted. I recommend packing your own food, though. 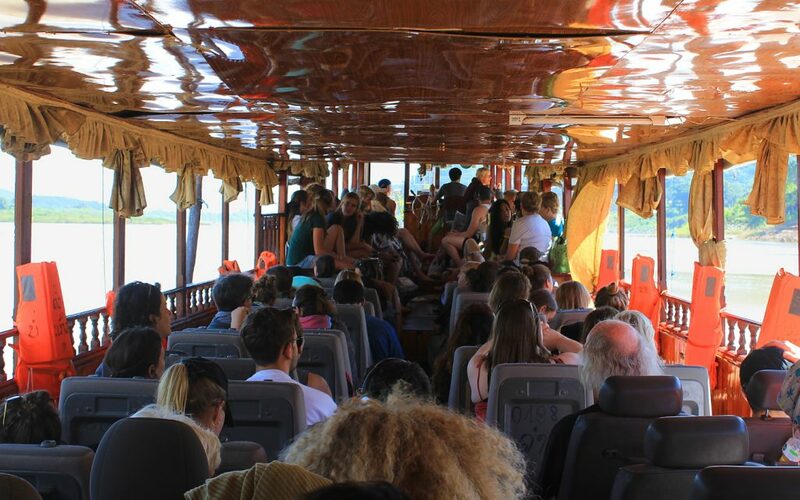 The slow boat from Huay Xai to Luang Prabang is full of Western tourists. If you end up sitting in the back, the boat engine can be quite loud, so you might consider taking ear plugs with you. Otherwise, just take whatever you need to pass time: a book, camera, music on your phone… Or you can simply spend the whole journey talking to other passengers on board. 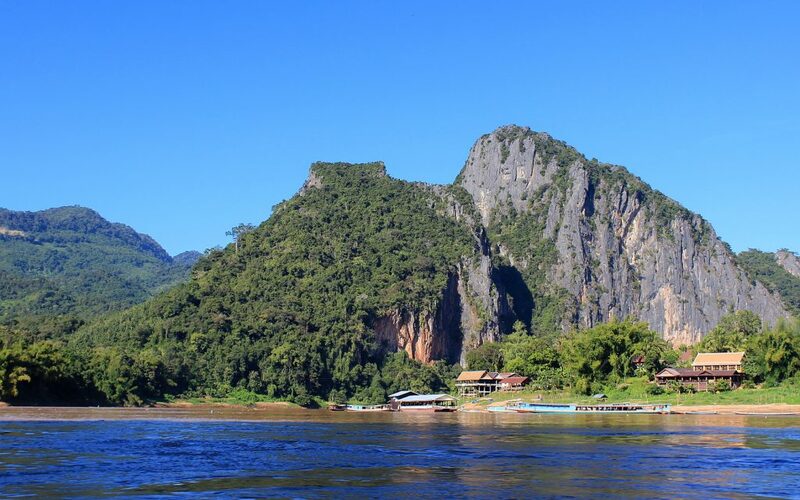 How long does the boat cruise from Huay Xai to Luang Prabang take? On the first day, our boat left at 11 am and arrived after 5 pm at Pak Beng. The next day, we left at 9 am and arrived in Luang Prabang at around 4 pm. So, it’s about 6-7 hours per day. Where did you say the boat stops? The slow boat from Huay Xai to Luang Prabang stops overnight at Pak Beng, a small village with plenty of accommodation options and not much else. The boat also makes other stops along the way, picking up and dropping off locals in strangely remote locations. The boat stopping in the middle of nowhere. Should I book my accommodation in Pak Beng in advance? It’s not necessary. If you don’t book a hotel in advance, you can easily get one when you arrive. There are plenty of hotel workers waiting at the harbour to pick tourists up. How much is the accommodation in Pak Beng? I booked my hotel room in advance and paid about 180.000 Lao Kip (22 US$) for one night. However, I heard that two other backpackers managed to get a room for 50.000 Kip (6 US$). Can I pay with other currencies besides Lao Kip? Yes, you can use US dollars and Thai Baht if you want. The ride offers some spectacular views! 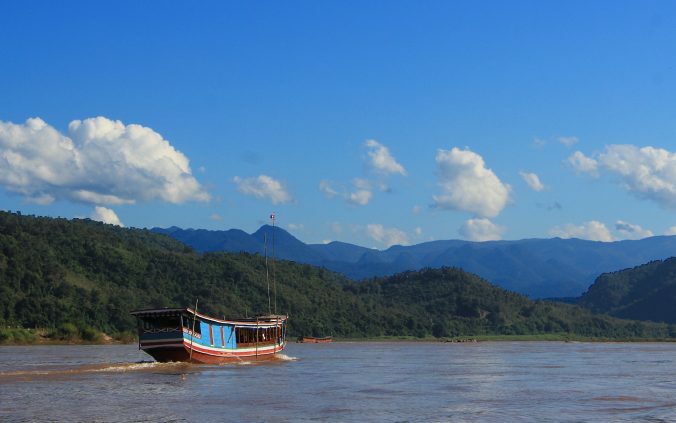 And how much does the slow boat from Huay Xai to Luang Prabang cost? 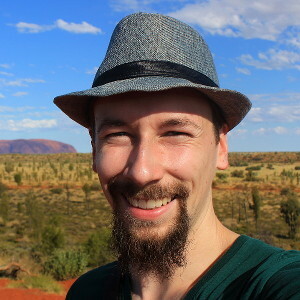 I paid 240.000 Kip (29 US$) for my ticket, including the hotel commission. If you buy the ticket directly from the boat company, it’s about 2 US$ cheaper. Your backpack might be stored in an inaccessible location, so pack all your food and other supplies in your day bag. If loud noises disturb you, sit in the front. Besides the loud engine, the travelers who buy drinks at the bar usually gather in the back, making the area even louder. 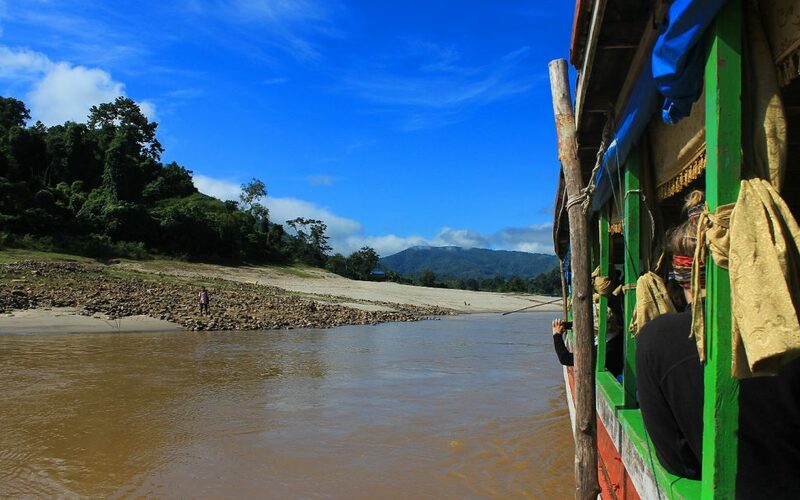 And although I’m only talking about the Mekong river cruise from Huay Xai to Luang Prabang here, it’s also possible to take the slow boat from Luang Prabang to Huay Xai. The bus from Huay Xai to Luang Prabang is faster. 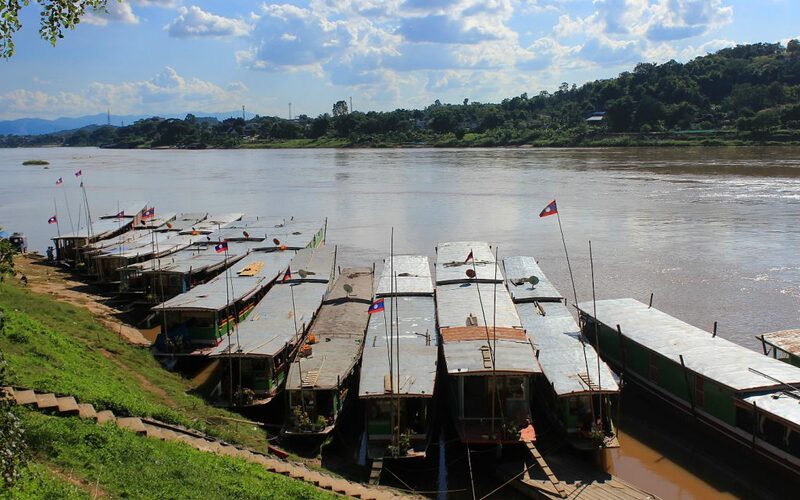 Is the slow boat cruise along the Mekong river worth it? 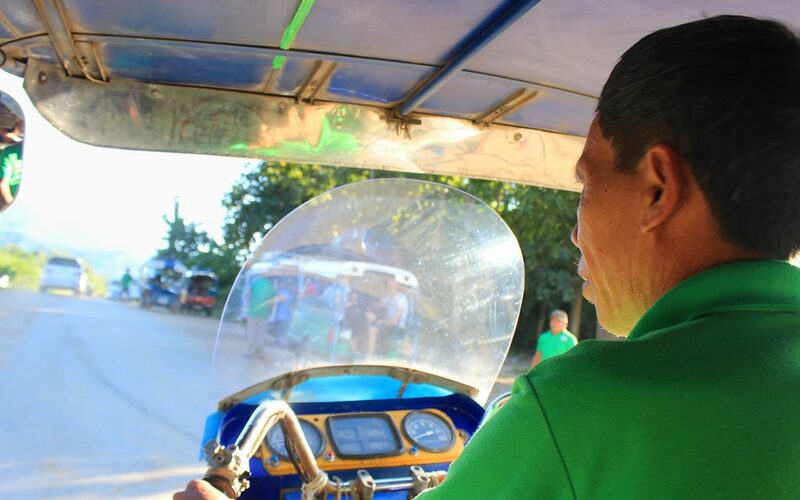 The slow boat cruise on Mekong river ends a few kilometers away from Luang Prabang, so you need to pay for a tuk tuk to reach the town. Of course. Inspiring blog and great pictures! 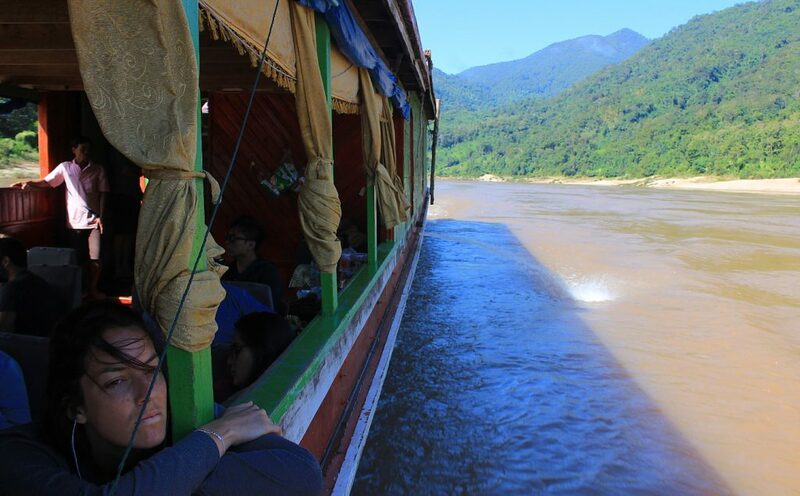 Really loved the trip by slow boat to Luang Prabang! Thank you Frank! 🙂 Glad to hear you liked it too. That really helps. Very focussed. It ändertest all my questions. You’re welcome! 🙂 I booked the ticket via my hotel in Huay Xai. Hi, which boat company did you buy your tickets from? Hi Paul! If I remember right, I bought my tickets from my hotel (Oudomsin Hotel). hi, which agency you picked to buy the tickets ? is the normal price 29 dollars for slow boat or I can find some trickster guys ? I booked the boat at my hotel (Oudomsin Hotel). 29 dollars was the normal price one year ago.